Duck Harbor Mountain is the most prominent feature near Duck Harbor Campground. 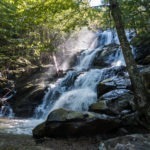 Rising to an elevation of around 300 feet, the mountain forms the best hike near the campground too. 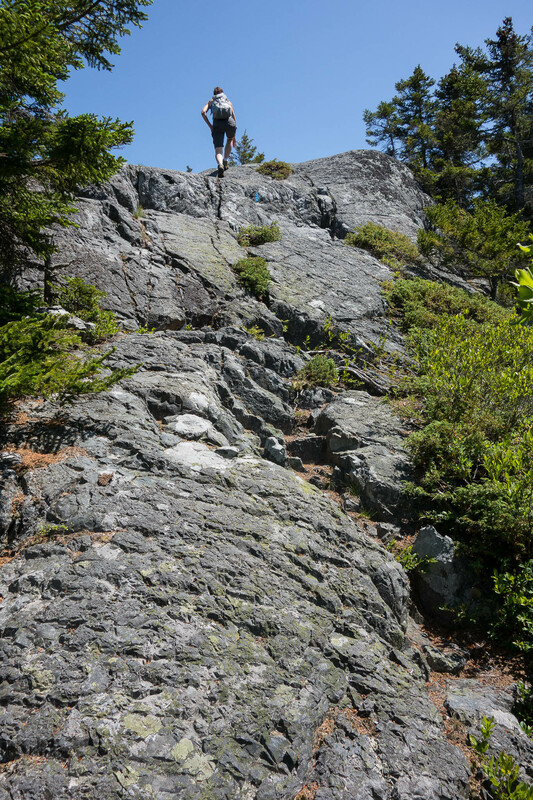 There are a few loops that can be created via the Duck Harbor Mountain Trail, and we chose a 4.2 mile loop. 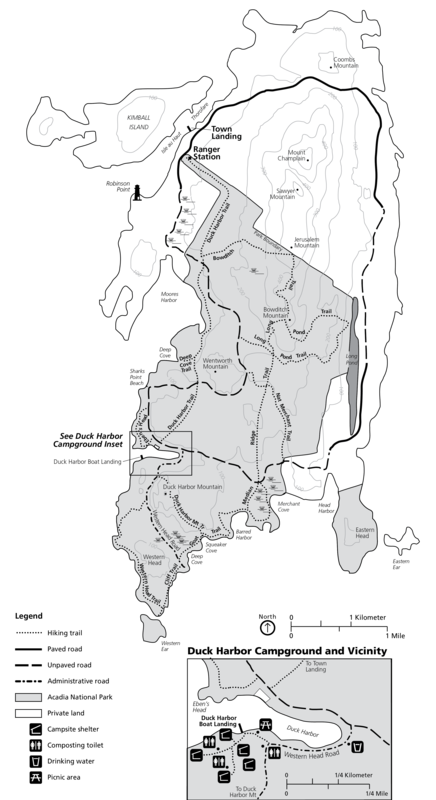 The loop starts near Duck Harbor Campground and ascends to the summit of Duck Harbor Mountain, then heads west along the coast, and finally returns north to complete the loop. 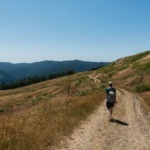 You’ll experience a variety of environments on this loop: mountains, the coast, marshes, and more. We had just arrived at the campground, and had only gotten settled in for an hour or so before we ventured out, but it was already early afternoon. We wanted to experience as much as possible during our 4 days and 3 nights on Isle au Haut. Heading east from the campground, we walked along a small trail that goes along the shore of Duck Harbor. We ventured off-trail for a view of the harbor and rocky shoreline. 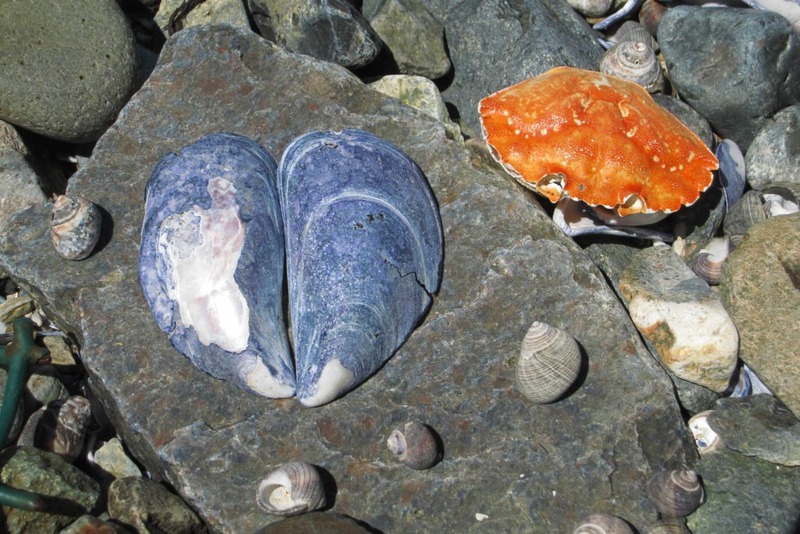 There we found lots of mussel shells, as well as a few crab shells. The crab shells intrigued us, we wondered why there were so many. Later, a park ranger told us that seagulls routinely drop live crabs on the rocks, feast on the crab, and leave the shell behind. 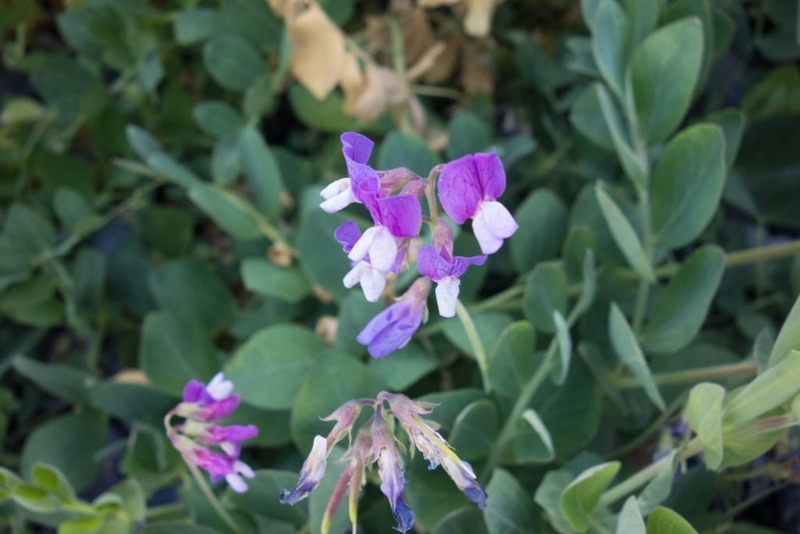 So you’ll find them scattered along the coastline. 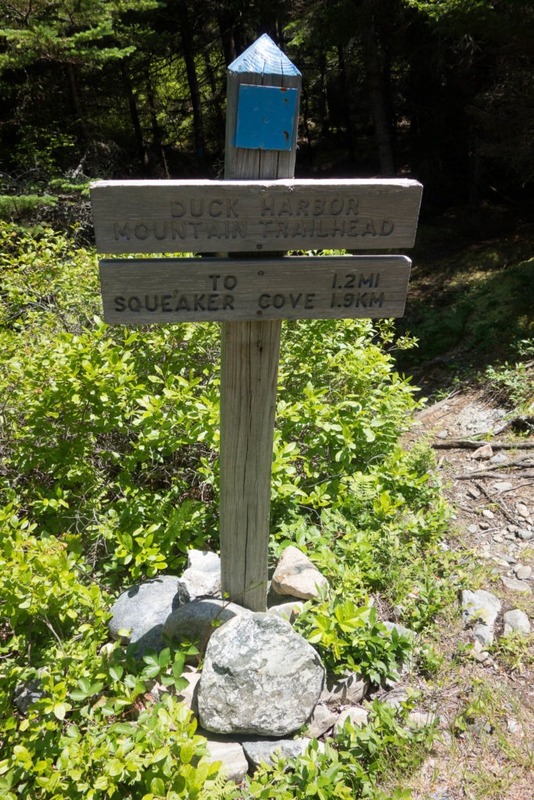 Soon, we reached the Duck Harbor Mountain trailhead sign. The trail begins on a service road, and a pit toilet is conveniently located at the trailhead. We turned right to continue on the service road, and immediately stumbled upon the log cutter for the campground. We had been wondering where the machine was! After 0.1 miles on the service road, we turned left into a wooded area to continue onto Duck Harbor Mountain Trail. We started going uphill, over roots and rocks. As we continued, the trail led out of the forest and onto huge exposed rocks. 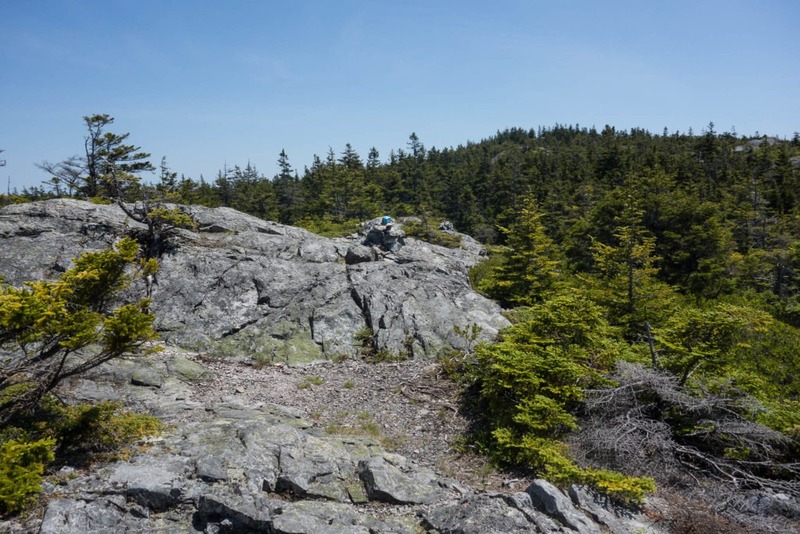 Here, we relied on cairns to point the way up to the summit, which reminded us of our hike at Pemetic Mountain. Hiking on the exposed rock soon gave us amazing views of Duck Harbor, and the surrounding area. 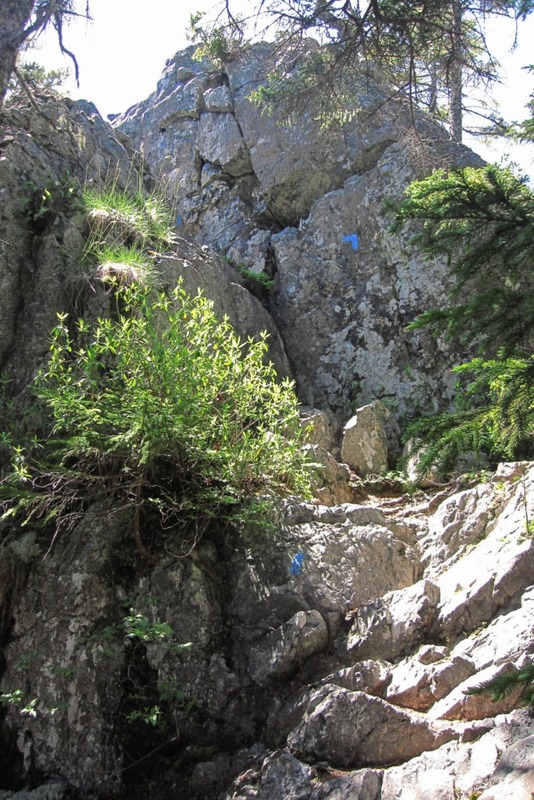 There are also some blue blazes that pointed us in the right direction. Only 1.2 miles to Squeaker Cove! Before long we reached a false summit, which provided great views of the harbor. We actually thought we were at the top at this point, before noticing we could continue uphill. We took a break anyway, enjoying the breeze and vistas. The hike continued, going downhill briefly before ascending the mountain again with some cool rock scrambles. Some of the rock features were a lot of fun to climb – this was a definite highlight of this hike. When we saw a US geological survey marker, we knew we had reached the summit of Duck Harbor Mountain. Interestingly, we preferred the views from the false summit. Great view of Duck Harbor (from the false summit)! The descent sent us scampering over rocks, passing through a narrow path between boulders, and into a pine forest, as we slowly hiked to the coast. 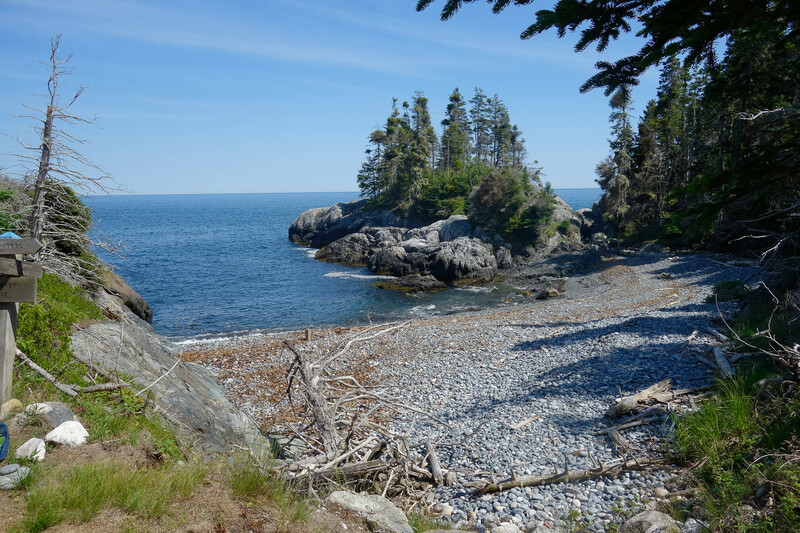 It wasn’t long until the Duck Harbor Mountain trail ended, and we reached Squeaker Cove, a beautiful rocky beach where we took a break and relaxed. We felt the refreshing sea breeze, and enjoyed the sound of small rocks rolling around as the waves came in. We think the cove was named for the “squeaky” sound the rocks made as they tumbled. This was one of our favorite places on Isle au Haut; it felt very secluded and peaceful. It was also fun to walk around the cove, and peek in some of the tide pools. Eventually, we had to leave Squeaker Cove behind. We turned right onto Goat Trail, which continues along the coast and eventually hits the access road we had started on. If you’re looking for an easier hike back to the campground, you can take the access road. As we came to the road, we met Alison, the park ranger who had met us at the dock, with one of the other rangers. “I thought you were going to take it easy and relax today?” she said. We laughed, since we had told the rangers that our plan for day 1 included lots of relaxing. 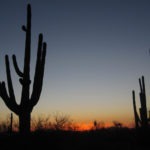 But we quickly realized how tough that is when you’re in such a beautiful place with so much to explore! We waved goodbye as they drove on, and we continued onto the Cliff Trail. The Cliff Trail ends at the southern end of the Western Head Peninsula. Here, Western Head trail begins, heading north. Western Ear Island is also at the southern end, separated from the peninsula only by a narrow sand bar. At low tide, you can cross onto the island. We were hoping to do just that, so we could explore the tiny island (there aren’t any trails there), but sadly we had arrived solidly at high tide. So we just sat there, enjoyed the view and perfect sunny-but-breezy weather before continuing on. If you happen to get to Western Ear Island, let us know how it is! 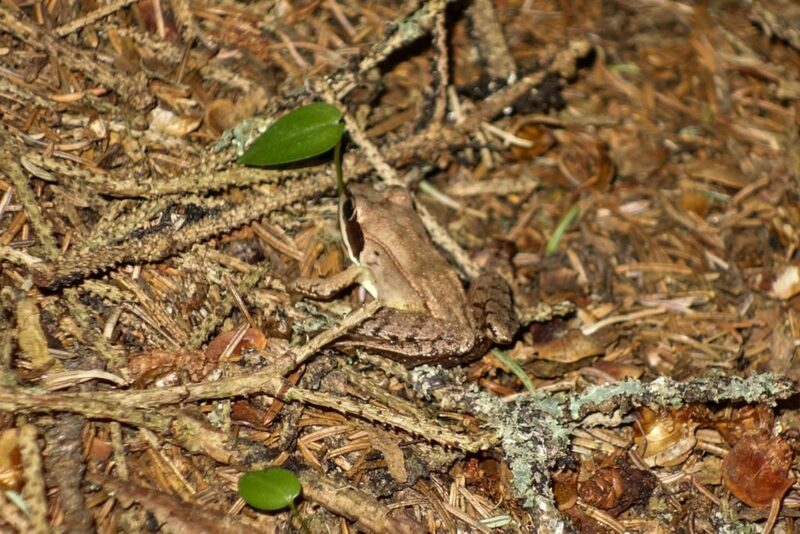 Soon we were on a boardwalk crossing a marshy area. I was immediately on the lookout for some carnivorous plants; we didn’t see any, but we did see a small wood frog. We also came upon various coves and beaches as we hiked. Sadly, some were strewn with trash and buoys. If you collect a certain number of buoys, you can earn a junior ranger badge. It’s for kids (mostly), but the rangers offered it to us to if we collected bouys. We found out too late, otherwise I would have! 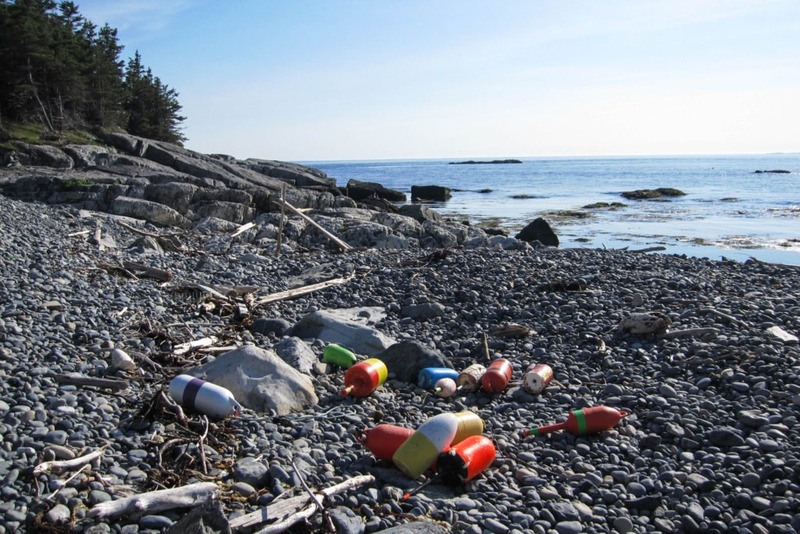 The buoys are heavier than they look, so you might want to spread it out if you do choose to collect them (and help keep the beaches clean). Every year a group travels to Isle au Haut to clean up the beaches and coves, but a lot of trash washes in the rest of the year. It’s a bit disheartening, as some places have a lot of it. Buoys on the beach look pretty. But they’re actually trash. As you cross the rocky beaches, there are cairns to guide the way. It’s a bit of a hunt sometimes to determine which way to go. After 1.5 miles on Western Head Trail, we joined back up with the access road, and continued 0.4 miles back to the trailhead. We made it back to our campsite while it was still light out, which allowed us to see a gorgeous sunset as we ate dinner and relaxed in our hammock. A great first hike on Isle au Haut! 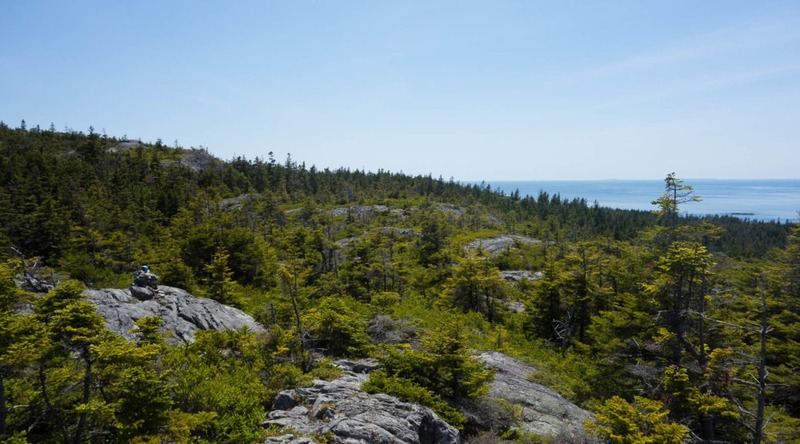 And spoiler: It was our favorite hike on Isle au Haut. Crowds: We saw only about 3 people on the whole trail. 5 counting park rangers. 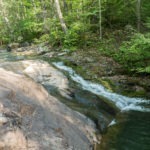 Water: There’s the ocean… a few small streams you’ll step over, and some boggy areas. Mile 0.0 – At the intersection with the service road that cuts through Western Head, head south. You’ll pass a wood cutter in a few hundred feet on your right. If you look closely, you may see some sundews along the road. Mile 0.1 – Turn left onto Duck Harbor Mountain Trail. 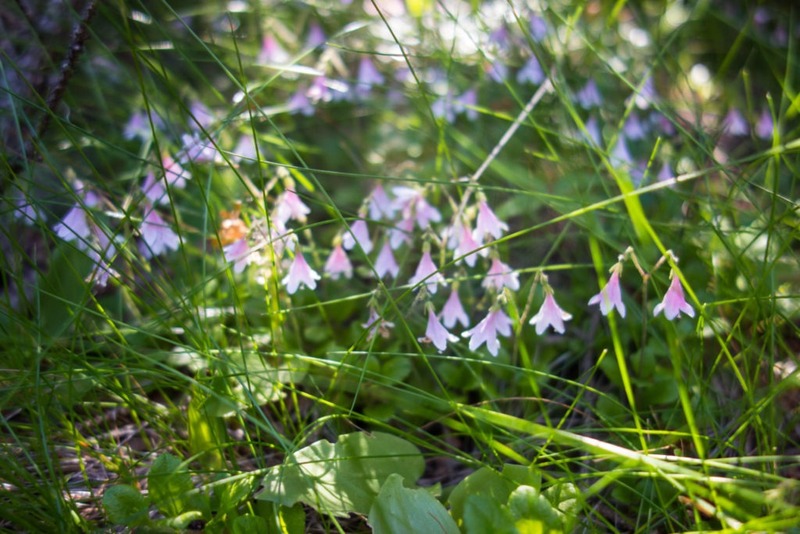 You’ll go through a forest with rock scrambling and incline to reach the top of the mountain. Along the way you’ll also get to a false summit, with great views. Blue blazes and cairns will help you on your way. Mile 0.2 – Arrive at the “false summit” of the mountain. See the views, then descend a bit before ascending toward the actual summit. 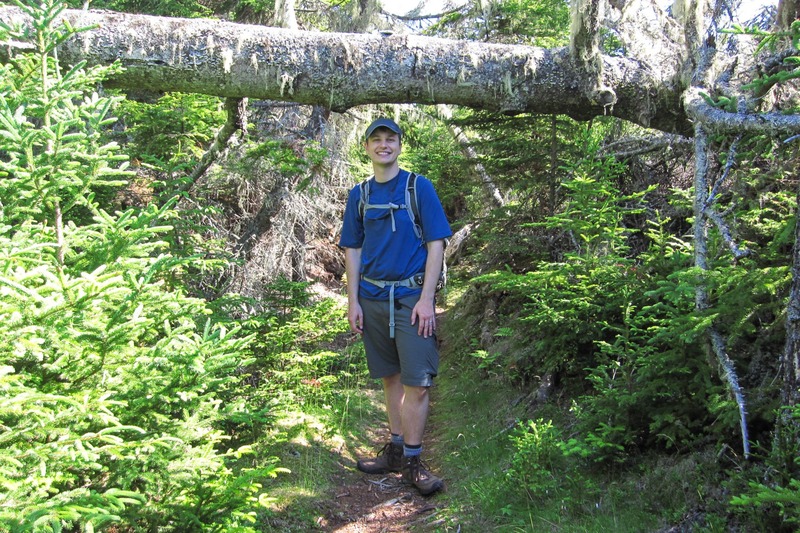 Mile 0.4 – Arrive at the summit of Duck Harbor Mountain. Views weren’t as great as those at the false summit, though. 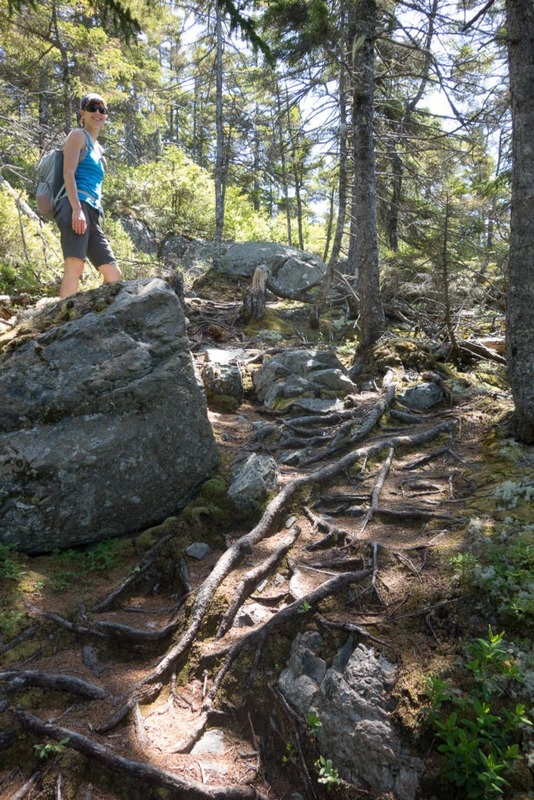 Continue your descent, scrambling along the way as you go through mossy forests. 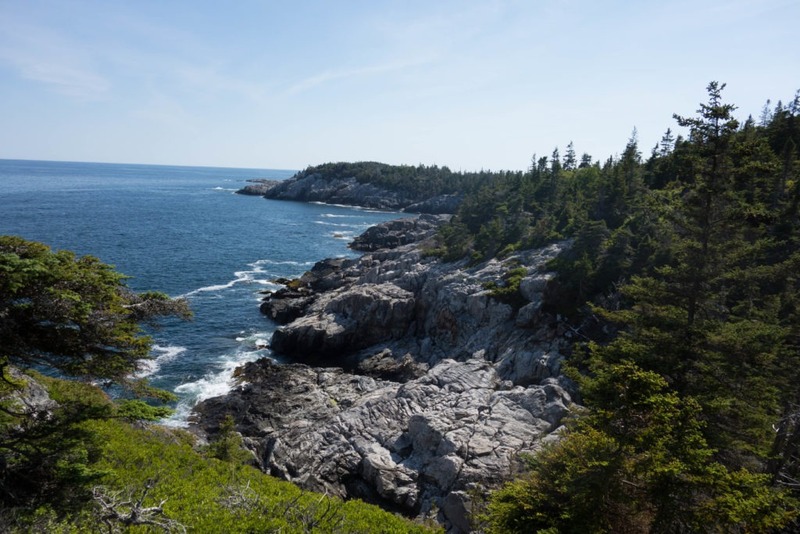 Mile 1.2 – Arrive at Squeaker Cove, and enjoy the sights and sounds. Then turn right onto the Goat Trail, which is relatively flat. 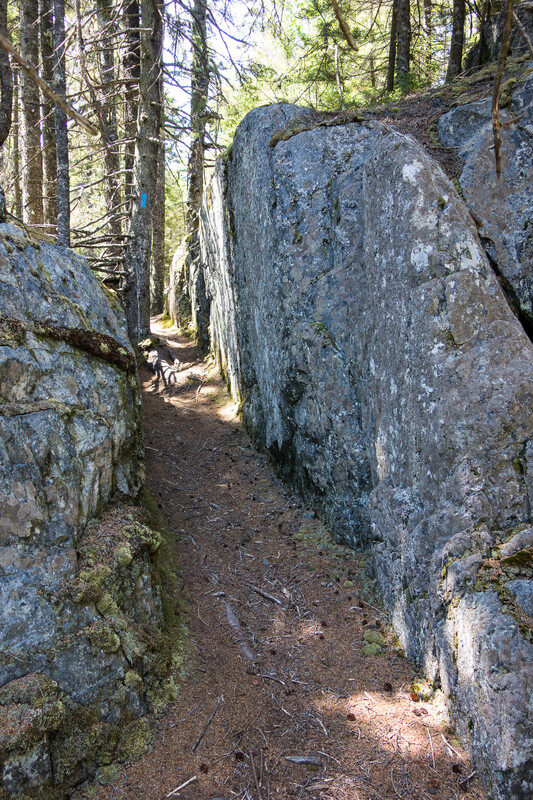 Mile 1.5 – Continue straight onto the Cliff Trail. You’ll see Western Head Road (the service road) on your right. Mile 2.3 – Reach the southernmost tip of Western Head Peninsula. 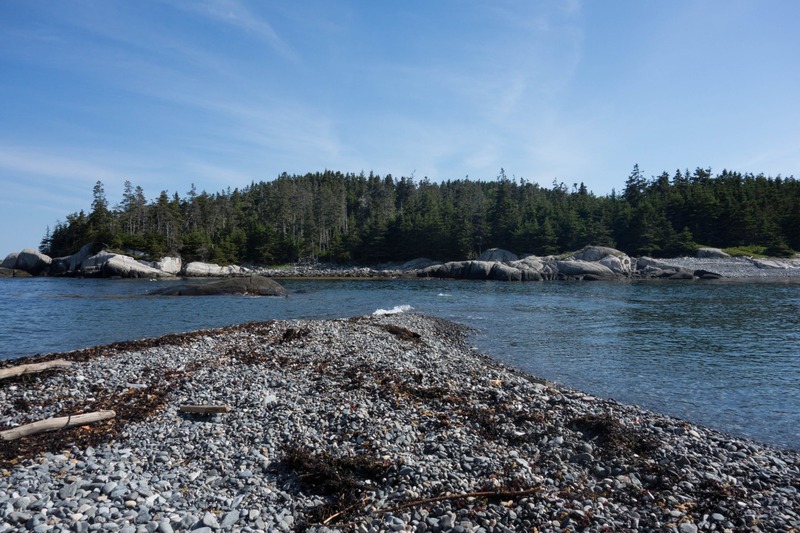 If it’s low tide, you can cross over to Western Ear Island and explore! 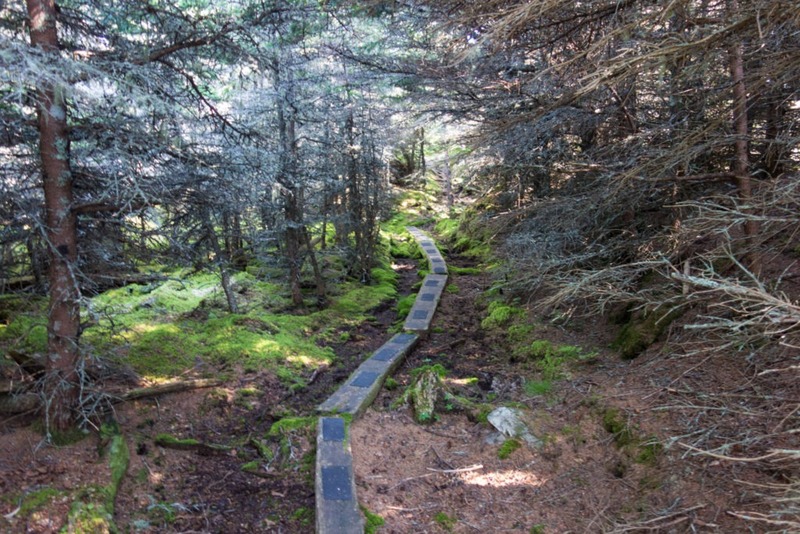 Head north on Western Head Trail to go across boardwalks and through a somewhat swampy area. There are a lot of rocky beaches along this trail too. 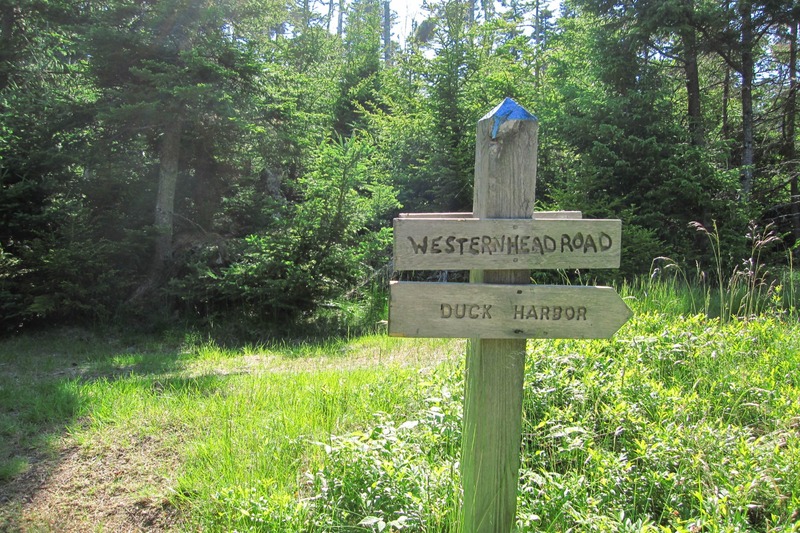 Mile 3.8 – Turn left onto the service road (Western Head Road), and continue north, eventually passing the trailhead for the Duck Harbor Mountain Trail. 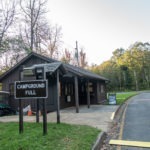 Mile 4.2 – Arrive back at the trailhead! 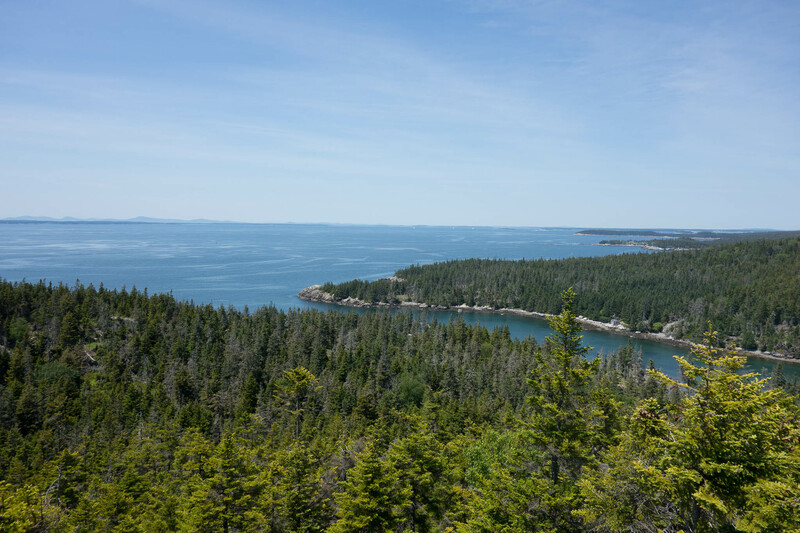 Notes: Our favorite hike on Isle au Haut!